Cole Porter has thought us to accentuate the positive, so we'll start with the good news: Musically you can't argue against this one. Fabulous opera and the three principals are in great voice. In fact, you'll seldom hear Tatiana more beautifully sung than Fleming does it here, even though she maybe doesn't have that typically darker Russian sound. No problem - she's fab. The chemistry between Hvorostovsky and Fleming is something to behold. Sparks fly in their scenes together, especially in the final scene. Now the bad news: If it doesn't take anything more than what Robert Carsen provides us with here to become a producer at arguably the most important opera house in the world (the Met) I think I'm gonna change my job and become a producer myself. The whole opera is set in what I can only describe as a sort of three sided giant white box that becomes dark blue at night, red when the sun comes up, and so on. During the first three scenes the floor is covered with leaves (to match Tchaikovsky's autumnal music I pressume - what would we do without those creative modern-ish producers these days? ). In the party scene of the second act there's a rug on the floor surronded by chairs. Lots of extras on stage during the party scene but eveybody is on that rug and leaves the rest of the stage for what it is. In the duel scene there's nothing but the giant box. At least in the final scene there's a chair. Fans of Hvorostovsky and Fleming needn't hesitate to buy this, they are wonderful. Casual opera fans better look out for a different Onegin DVD than this one. The leaves scene part two - usually known as the garden scene. Maybe they have sweeped Tatiana's bedroom after all at this point and depositted the leaves in the garden. They definitely don't come from the non-existent trees. Wow, what extravagance - Robert Carsen has actually allowed a chair in the final scene! Franco Zeffirelli eat your heart out! Last edited by jhar26; Dec-25-2010 at 13:25. About a month ago, I checked this out from the local lending library. Yes, most reviewers came down on the side of "great musically/leaves something to be desired in the realm of production values" as a summation. Now, I certainly don't disagree with those who levy criticism on the production. I can't help thinking that production variant here is rather tame, when contrasted to what's being done to Wagner on the boards of most of the opera houses of Europe, though. I'm so grateful to you guys for all the reviews & recommendations. I'm falling hopelessly behind everyone but thank goodness for Amazon Wish Lists. I'm useless at organising my time. I leave home about 06:30 & get home about 17:30 & after cooking then eating my tea, washing up & doing other stuff, doesn't leave me much time for watching. I do still get my 80 minutes a day listening though & that's probably why CDs are more of a priority at the moment than DVDs even though there's a big pile of unlistened. I have just had this in the post which I'll watch at the weekend. 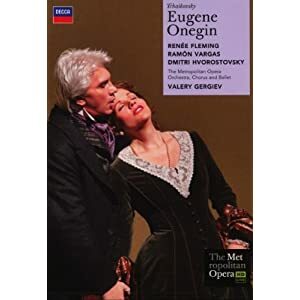 Probably the best Onegin ever. I'd second that. Wait till you get to the last scene, you will cry like a baby. Musically it's very good indeed. The production is not my cup of tea though. Not enough furniture and too many leaves. Those leaves are one of greatest ideas in modern productions. Yes, in general scenography is very poor for someone that expected something bigger but one can't say that this staging is not ingenious. The only scenes that got hurt in all of this are scenes inside of some places (ball) but the rest is awesome - the leaves evoke particular mood (beginning with Onegin being overwhelmed with them) and the chair that is notably only one object in both first and last scene makes a lot of sense too. I love the staging. My favourite bit is the transition between the duel scene and the ball scene, with Onegine being dressed by his valets - it speeds up the action makes an excellent bridge. I actually prefer sparse stagings - I dislike Zeffirelli-like huge spectacles as for me they distract from the human element. I'm sure that it makes sense and that it's an ingenious staging - everyone seems to like it. But there's always one in a crowd that doesn't, and in this case I'm that one. But I'm not a big fan of Robert Carsen's productions in general. I dislike his work on Rusalka even more. It came as a surprise to me that I sorta liked his Capriccio. And they have managed to make us forget that there isn't much furniture, just by tracing a ball space with some chairs. That's the right kind of minimalistic production. Very tasteful. And the singing was superlative. I agree that it's the best Onegin ever. I just loved it, and then watched it again with a Russian friend who could sing along and explain several details about Russian culture while we watched it. She did say that Renee's Russian was atrocious, LOL. This wouldn't have happened if they had my Anna for the part. Last edited by Almaviva; Oct-15-2010 at 00:09. And the singing was superlative. That I agree with. And Hvorostovsky and Fleming are outstanding in the last scene. Not to forget the letter scene, in which this middle-age woman looked exactly like a young teenager in love! Renée is really extraordinary - looks, voice, acting, she got it all. I bet you'll be able to agree with this part too, right? PS - Not that my Anna wouldn't have done it even better. She would have done a good job, but not better than my Renée!